Boss mentioned this casket- and urn-producing company in a Blogdome over a year ago, so you probably all remember it vividly, which means this post is a repeat. Does your loved one need a Major League Baseball logo emblazoned on their casket or urn? Is your loved one a Cleveland Indians fan? Until recently, the ceremonial tribal burial was not possible. Fans who live and die with the Tribe can now spend eternity with the team, too. 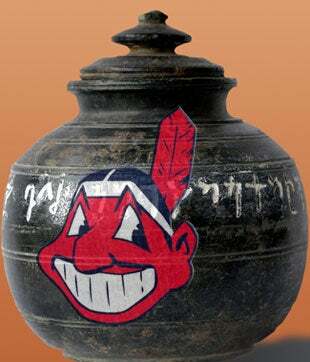 A firm that promotes Major League Baseball-licensed urns and coffins rolled out an Indians vase this summer and plans to add a Tribe casket next year. It's a great idea, because, ya know, one isn't able to slap an iron-on decal on the side of the urn. Your grandfather's ashes will know the difference, and will subsequently haunt you at the most inopportune times, such as when you're about to score with that Russian gymnast chick who finally returned your calls. The company, Eternal Image, also offers urns and caskets for eight other MLB teams, cat lovers, dog lovers, and Star Trek fans. While it looks rather cool, the Star Trek urn is a poor choice, because this means a Trekkie has a friend to purchase it after he dies.